This property is a two bedroom townhouse (ie 2 level home) where the entrance leads first to a well-equipped modern luxury kitchen with integrated appliances including dishwasher and washing machine. Continuing you have an open plan living and dining room, stylishly furnished with 2 comfortable sofas, coffee table, TV, DVD and dining table and chairs. From here, two sets of double patio doors open out onto the garden - perfect for small children to play or for relaxing in the sun with a good book. . Beyond the garden are pine trees and the 7th fairway. Upstairs you have the master bedroom with ensuite bathroom. The second twin bedroom has an ensuite shower room and patio doors to a balcony with stunning views of the golf. All bedrooms have fitted wardrobes. 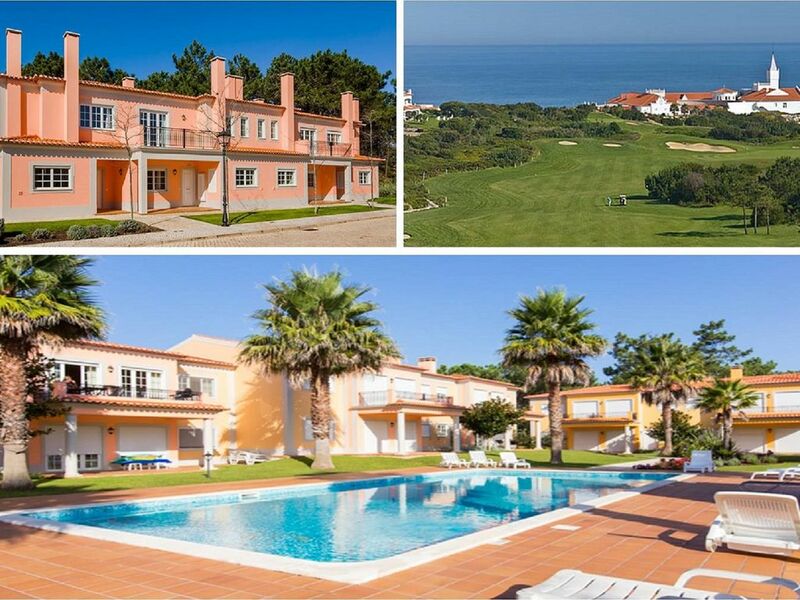 Spacious Homes in convenient locations within the Golf Resort of Praia d'el Rey. All have beautiful gardens and pool(s) close by (heated in summer). All are within walking distance to the tennis courts, Club House, Practice arena and the beach. The 5* Marriott Hotel is also a short walk and the hotels facilities are available for your use (at their standard charge rates. These homes are an ideal base for family or action packed holidays with many facilities available in the surrounding area. Praia d'el Rey is one of the most highly ranked European Golf Courses with numerous other facilities including tennis, children's playground, shops, bars, restaurants and the 5* Marriott Hotel. All this and still within easy walking distance from some of Europe's finest beaches on the Silver Coast. Perfect destination for just relaxing or activity filled holiday (golf, surfing and other water sports). Enjoy alfresco dining in the garden or try some of the local renowned sea food restaurants. Lisbon is just 45 minutes. Other historical places such as Obidos, Cascais, Mafra and the Sintra are between 15-45 mins. Available at extra cost during the winter months. Casa espetacular, nova, moderna e muito confortável. Maison conforme au descriptif propre et en bon état. Seul bémol ! les équipements de cuisine sont réduit au strict minimum 8 assiettes, 1 poêle, 2 casseroles.. etc Il faut faire les lave vaisselle tous les jours. First of all thank you for your kind review. I'm very glad that you and your family enjoyed your stay in our stunning property. Looking forward to welcome you in a near future with an amazing weather. The property will be cleaned before your arrival and should be returned to us on your departure in a similar manner with all garbage removed. The property is STRICTLY NO SMOKING inside. A security deposit will be collected and refunded via PayPal using a credit/debit card. You do not need and account with Paypal. This will be refunded within 14 days from departure once the property has be cleaned and inventory checked. Portugal have implemented Article 45 of the Schengen Agreement. We are now required by law to collect and submit to SEF (Serviço de Estrangeiros e Fronteiras) identification details (Passport or ID cards) of all guests in paid accommodation.